I’m going to come out and admit it: I love the original Jumanji. Sure, its CGI has aged terribly, and yes, it was pretty silly to begin with. But the Joe Johnston-directed 1995 movie made a fantasy children’s picture book feel genuinely thrilling to me as a kid, one where the perils of the jungle invaded the domesticity of the real world, where characters’ lives were at the mercy of the roll of the dice. 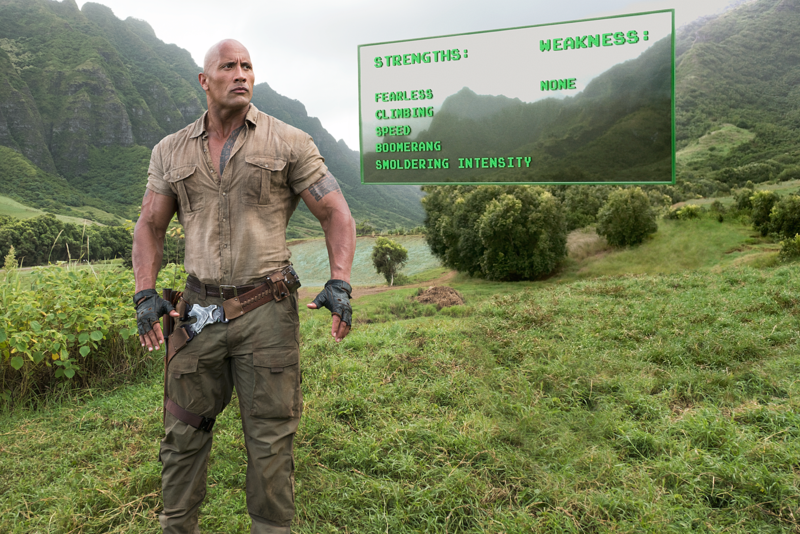 The new Jumanji: Welcome to the Jungle, which is less of a direct sequel and more of a reboot – though it does reference Robin Williams’ Alan Parrish briefly – nixes that original premise to take us inside the game. Directed by Jake Kasdan (Walk Hard, Bad Teacher), Jumanji: Welcome to the Jungle opens in 1996 when a jogger stumbles upon the board game on a beach (slightly retconning the ending of the original, where the game ended up on a beach in France). He gives it to his teenage son, who’s too busy playing video games to care about it. To solve that problem (and in an effort to modernize this movie) the magical box suddenly spits out a knock-off Super Nintendo cartridge. Intrigued, Alex pops it in, then gets sucked into the game. Fast-forward to present-day when a foursome of high school stereotypes –there’s the gamer geek, the arrogant jock, the Instagram-obsessed cool girl, and the awkward rebellious girl – get stuck in detention together. There they find the old game, plug it in, and suddenly they’re teleported to the alternate reality of Jumanji. 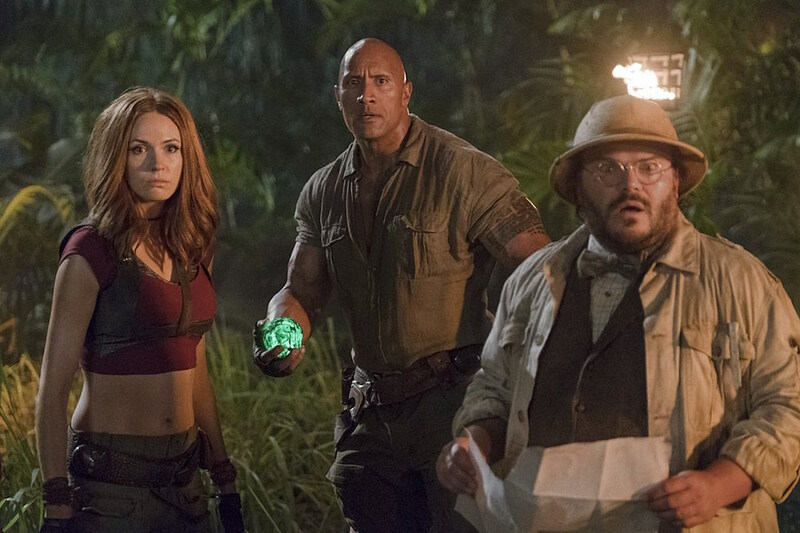 Once inside the game, the foursome learn Jumanji’s fate is at stake – Bobby Cannavale plays a goofy bad guy vying for a magic stone to control the jungle – and that they have to save the tropical world in order to get back to their own. But Welcome to the Jungle is less interested in the actual game of Jumanji and more concerned with the body-swap gimmick. The whole conceit of the film is placing teens in unlikely adult avatars. Spencer (played as a teen by Alex Wolff) is the timid nerd plopped into the chiseled body of Dwayne Johnson’s Dr. Smolder Bravestone, leader of the group. The towering footballer Fridge (Ser’Darius Blain) gets his height, and ego, chopped down in the short body of Kevin Hart’s Franklin “Moose” Finbar, Bravestone’s sidekick. The reserved Martha (Morgan Turner) is placed into the crop top-wearing body of Karen Gillan’s Ruby Roundhouse, nicknamed “Killer of Men.” And the biggest gimmick comes with Jack Black, portraying snobby teenage girl Bethany (Madison Iseman), known in the game as the bearded Shelly Oberon. Part of the body-swap narrative is used for humor, much of which is inane and unoriginal. But putting teens in mismatched avatars also propels the film’s cheesy mantra (which multiple characters reiterate) that “you only have one life to live, but it’s about how you live it that matters.” (They actually have three lives in the game, but whatever.) As much as I hoped the movie would take that somewhere a little bit deeper, it doesn’t. It ends with the sappy sentiment of a Disney Channel Original, where each of the kids walk away with a little more humility and confidence than they began with. Gillan is charming as she channels the mind of a self-conscious girl learning to find confidence, and she shares some sweetly empowering moments with Black’s Bethany. Hart is doing his usual comic routine of jokes about his stature, so if you’re a fan of his you’ll probably enjoy it; if not, it gets aggravating real quick. Black is fully committed as a teen girl whining about her missing iPhone, and as aptly as he mimics that type, the character’s whole schtick – a hairy middle-aged man acting effeminate and drooling over hot guys – closely rides the line of transphobia and homophobia. The material itself, and Black’s performance, aren’t necessarily offensive, but they operate under the (false) assumption that seeing a masculine-looking person behaving femininely and sexualizing other men should induce shock and laughter. While there are some charismatic moments from each, the fun of the body-swapping quickly fades, and the remainder of the movie recycles the same jokes. From there, it becomes a generic action-comedy. The 1995 movie didn’t have rhinos chasing after a helicopter or a hero escaping jaguars on a motorcycle; it didn’t need massive, explosive set pieces to generate suspense and excitement. I still remember its action scenes, which were genuinely scary and exciting. What’s freakier than the hazards of wildlife invading your home turf, where giant jungle spiders terrorize your attic, stampedes wreak havoc on your local grocery store, and the possibility being slowly turned into a monkey, all outside your control? Not much. In that movie the jungle felt magical and terrifying. In the new movie, the jungle is hardly a character at all. That’s fine, but why call it a Jumanji movie at all if the game is the least developed element? I’m grateful Welcome to the Jungle attempted to do something different, but it’s missing what made Jumanji, both the original movie and Chris Van Allsburg’s 1981 picture book, so fun. Kasdan’s film could’ve just been any generic survivalist action-comedy; slapping the board game onto the title is nothing but shameless branding.